Before the beginning of time! How do you understand when that was. God first thought of us at a time we cannot even begin to understand! His reason for thinking of us was to demonstrate his grace and call others to his side. 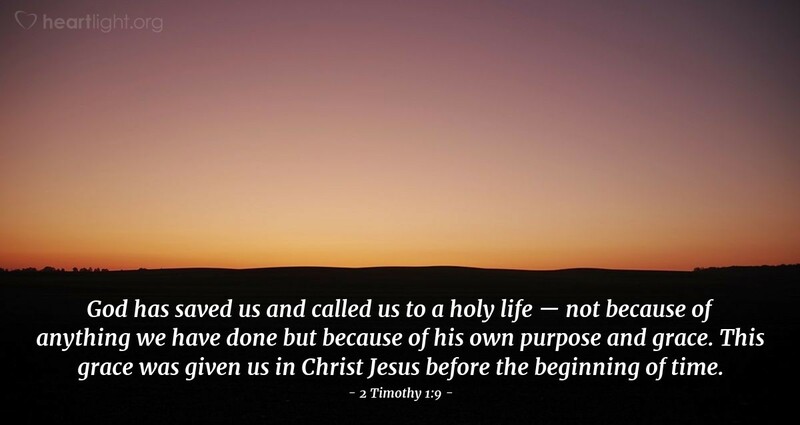 Jesus has always been God's plan and we have always been his goal. Let's make sure we respond by living his holy life! Thank you so much, Father, for knowing me and thinking of my needs even before there was a world. I dedicate this day, the days that follow, to your honor as I try to live a life that reflects your righteousness and grace. In the name of Jesus, the one who had no sin, I pray. Amen.